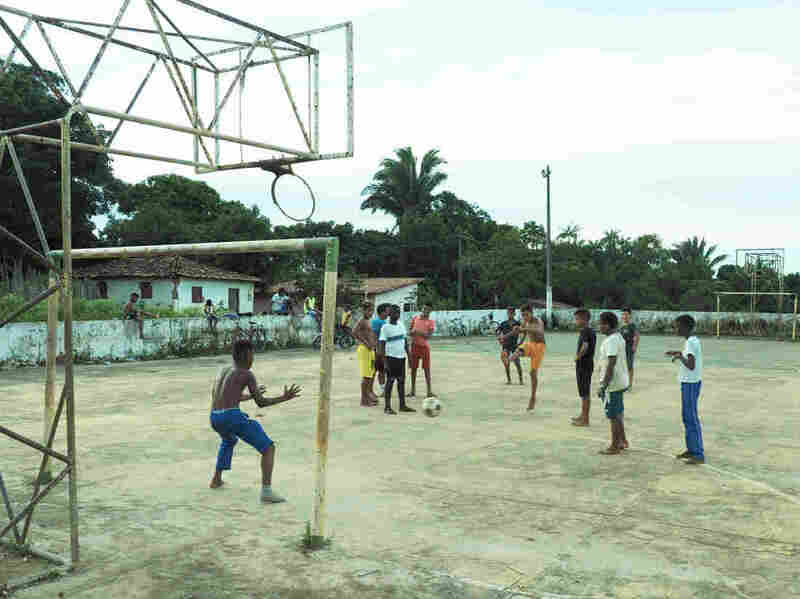 Brazilians Turn To Evangelical Church In Rural Town Wracked By Drugs And Poverty "Churches are taking over the leadership role which was supposed to be in the hands of the political powers," says a Catholic youth group member in the Brazilian town of Central do Maranhão. 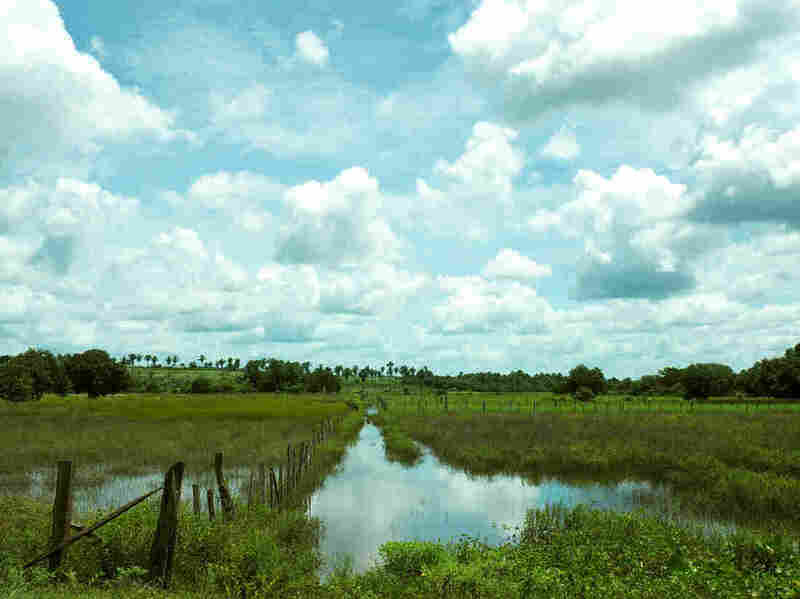 The town of Central do Maranhão, in northeast Brazil's sugar cane belt, is one of the country's poorest. These rice fields line one of the town's long, narrow dirt streets. Yet beneath the surface lies a troubled world, where drug and alcohol abuse are corroding the lives of many, especially young Brazilians. It is one of the poorest farming towns in Brazil, a community in the doldrums, where the only other social pursuit that appears to be truly flourishing — apart from booze and narcotics — is religion. Although it has a population of fewer than 9,000 people, Central do Maranhão has 18 places of worship, of different denominations, ranging from large churches to little more than cubbyholes. There are also about 40 bars, mostly drinking dens no larger than a small room. Young residents of Central play a pickup soccer game. The town is a scattering of low buildings and bungalows with red-tile roofs and grazing animals. Life moves slowly to a soundtrack of crickets, barking dogs, the occasional passing city-bound bus, and, in the evenings, lustily sung hymns floating out of the big white Catholic church in the square. Forty years ago, the Catholic Church was the only church in town. Then, the Baptists arrived, followed by others — from Jehovah's Witnesses to an assortment of evangelical organizations. Talk to residents here and it often soon becomes clear that they hold their political leaders in disdain, not least because of Brazil's massive corruption scandal, a deep recession and the epidemic of violent crime. Government at every level across the country faces accusations of failing the public; many in Central do Maranhão seem to share that view, and are looking elsewhere for solutions to their problems. The Assembly of God in Central holds regular youth services where young residents sing, pray, and worship together. This evangelical church has several other branches on the town's outskirts. Churches, in particular, are seeking to recruit young members. About a third of the town's young people leave for jobs or education elsewhere, according to the residents' association president, Maria Raimunda Piedade. Those that remain often run into trouble. "Young people here start to have families when they are 12, 13 or 14. And that's when there's a serious problem, because the young people don't have good judgment. They start to have kids, and the kids are needy," says Piedade, who set up a school, called The Good Pastor, to help infants from troubled families. "Churches are taking over the leadership role which was supposed to be in the hands of the political powers," says Luísa Viegas, 17, who's from a Catholic youth group that offers friendship and support to young people in town who are struggling with drugs. Evangelical churches have been sprouting up across Central do Maranhão. By far the largest of these is the Assembly of God, which is Brazil's biggest Pentecostal church overall, though fractured into different groups. It now has eight churches in this town, and is building a ninth. "We think that number is low. There could be more!" says Jádson Silva, 26, a youth leader with the Assembly of God. The growth of evangelism in the town mirrors a pattern across Latin America in recent decades. In Brazil, the number of people who identify as evangelical rose from about 1 in 15 in 1980 to just under 1 in 4 by 2010, according to national census data. 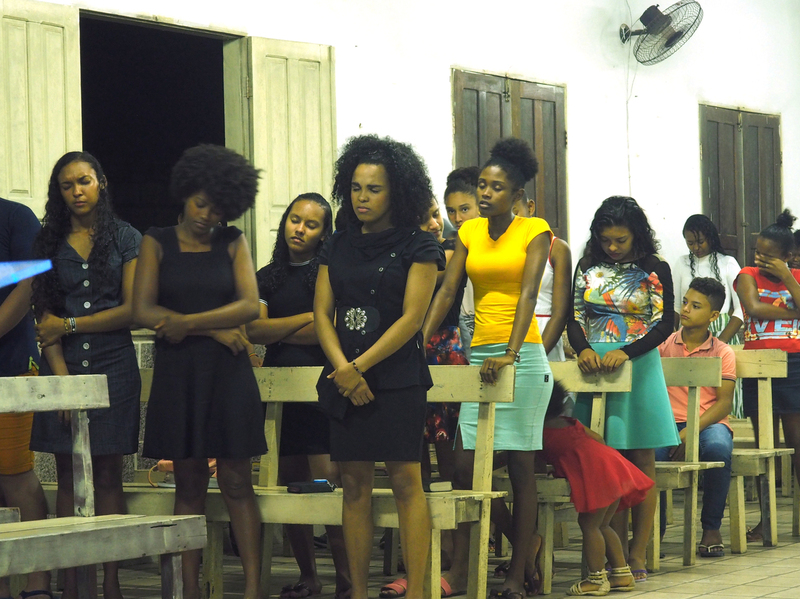 Church leaders say the numbers of young worshippers in their congregations have been gradually growing in Central do Maranhão, although they are vague about numbers. Estimates range from several hundred to about 1,000. Silva claims that up to 300 young people worship with the Assembly of God alone. "Many people have family troubles. They end up looking to the church for some guidance," says Silva, who drives a school bus for a living. This has another dimension: Evangelical organizations enjoy considerable political clout in Brazil. The evangelical caucus in Congress consists of 81 lawmakers, out of 594. Nationwide, evangelical churches run TV channels — one of Brazil's largest is the RecordTV network, funded by the Neo-Pentecostal Universal Church of the Kingdom of God — and hundreds of radio stations. Some of these organizations have an army of Internet activists pursuing their agendas. "The more ideological right-wing type of [political] involvement has been growing in recent years," says professor Paul Freston, a specialist in religion and politics in Latin America at the Wilfrid Laurier University in Ontario, Canada. "They started to have some prominent Pentecostal politicians and TV preachers and so on, who have made their reputation on the basis of their hostility to LGBT and so on," he says. However, Freston cautions against thinking of evangelical churches as essentially political organizations, adding, "they've got a lot of other stuff going on." Jádson Silva, of the Assembly of God, says he does not bring his personal politics to church, but says his town's evangelical groups generally lean toward conservatism rather than the left because, as he puts it, "the left is liberal and wants to legalize everything: drugs, abortion, everything that is evil." He says his own church is definitely conservative. So is he. Silva supports arming the Brazilian public for self-defense. He considers homosexuality to be a choice. In Brazil's presidential election in October, he plans to vote for the popular candidate from the far right, Jair Bolsonaro, who has close ties to the evangelical movement and is an admirer of President Trump. The scale of Central do Maranhão's social problems is widely acknowledged by its young people. "There's hardly a place here without drugs," says Vítor Hugo Costa, 19. "Life here is complicated. There are no jobs. There's nothing for anyone." Iragilson Froes is one of two police officers based in Central do Maranhão's tiny police station. He says the town's young people are easy prey for drug dealers. "There is nothing to distract the mind, so the tendency is to take the bad path," he says, adding: "Bad people are out there, trying to reach these youths by every possible means." Froes says that when youngsters finish school, they "tend either to go into farming or into crime, because unfortunately there's a lot of marijuana planted in the surrounding villages ... and people end up taking that option, as they want to make money more easily." He describes the narcotics trade as "the pivot of all evil" in Brazil, and says locally the level of use of marijuana, crack and cocaine is "very high." "Besides the drugs, there is a lot of alcoholism," says Froes, who's 37. "The youths drink a lot. Access is very easy. It is cheap, and there are a lot of alambiques," he says, referring to the stills used to turn sugar cane juice into the powerful Brazilian liquor cachaça. To what extent churches offer a tangible solution to these social problem is moot. "Unfortunately many of our youths and many children — before becoming teenagers — are introduced to the world of drugs. That happens a lot," says Joaz Alves de Castro, 19, who worships at the Assembly of God. "Our church doesn't have a rehab center, but we have helped a lot of young people. I have many friends who got involved with drugs and, through church, they changed," says de Castro. Luísa Viegas, from the Catholic youth group, says the organization runs campaigns and offers lectures advising young people about steering away from drinking and drugs. Yet she is not convinced this is working. "We try and try, but if it keeps going the way it is, drugs will take over everything," she says, "and we'll lose this battle." NPR producer Valdemar Geo contributed reporting to this story.